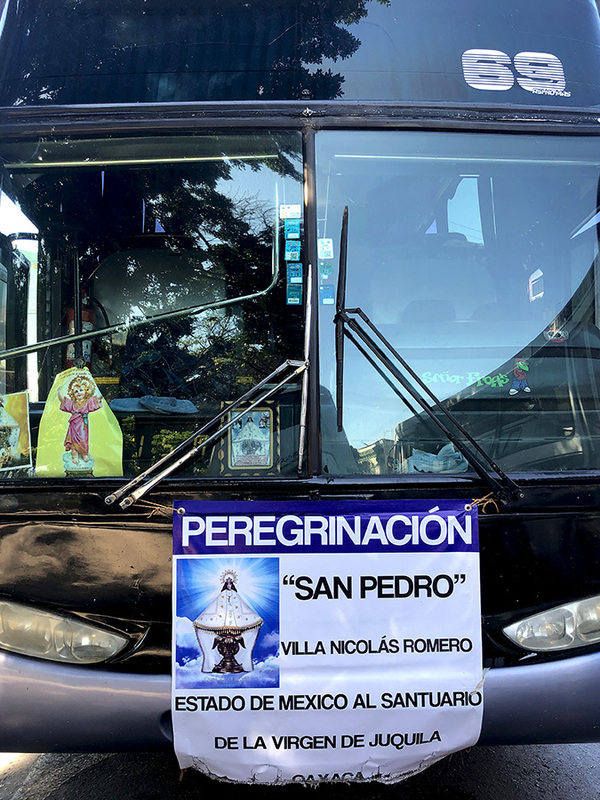 The booms and bells began yesterday morning announcing the faithful en route by bus, bicycle, motorcycle, and on foot to visit the image of la Virgen de Juquila high in the mountains between Oaxaca city and the Pacific coast. 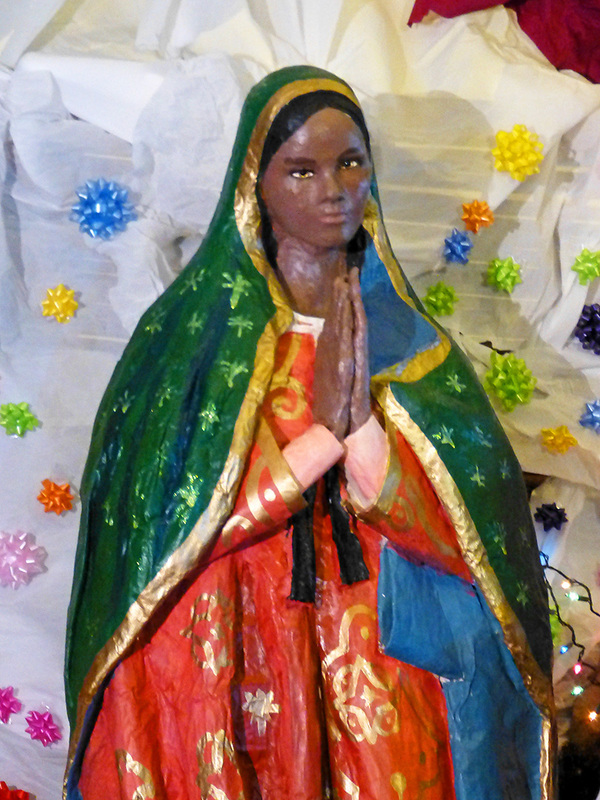 According to legend, in 1633, when a fire burned the small Chatino village of Amialtepec to the ground, a small wooden statue of the Virgin Mary was rescued amidst the ashes. She was undamaged, save for her light skin color, which was permanently darkened by the smoke, causing her to more closely resemble the Chatino people, who live in this remote mountainous region. Local priests declared her survival a miracle and she has been venerated ever since. 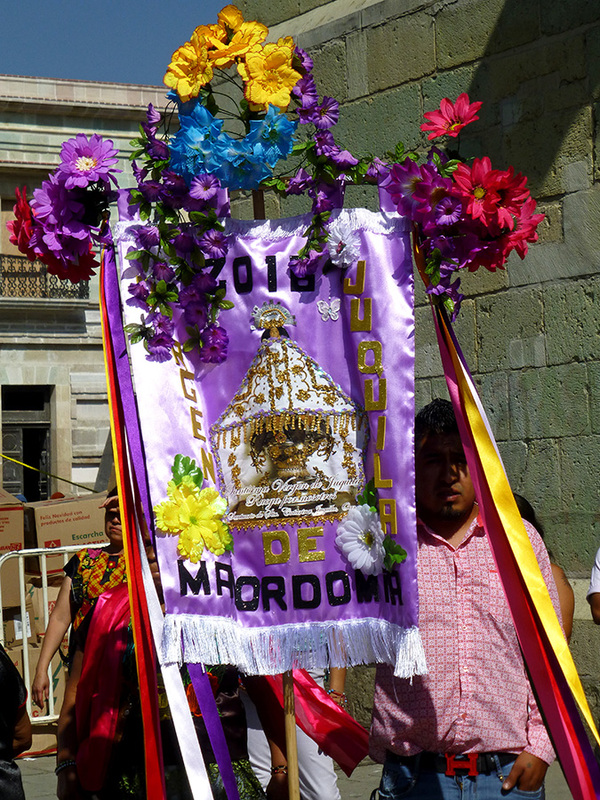 Alas, that wasn’t the end of the story; the priest in the village of Juquila convinced the “powers that be” that she should be moved to the bigger and better church in Juquila. She, however, had other ideas and returned to Amialtepec. This back and forth continued another three times. Finally, in 1719, La Morenita (the dear dark one), as she had come to be known, gave up her traveling ways and agreed to call Santa Catarina Juquila her permanent home. 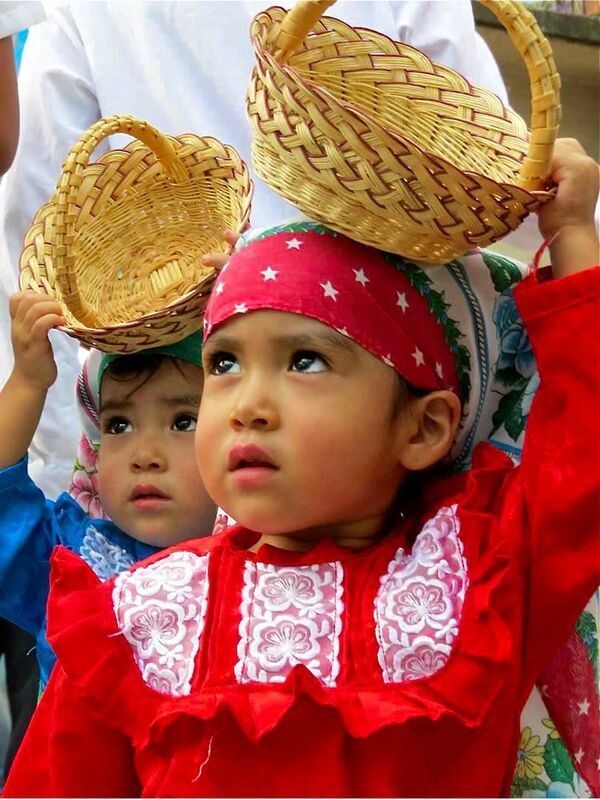 The faithful make pilgrimages to both her old and new mountain homes (about four hours southwest of Oaxaca city). They come year round to make offerings and pray for miracles, but especially during the days leading up to December 8. 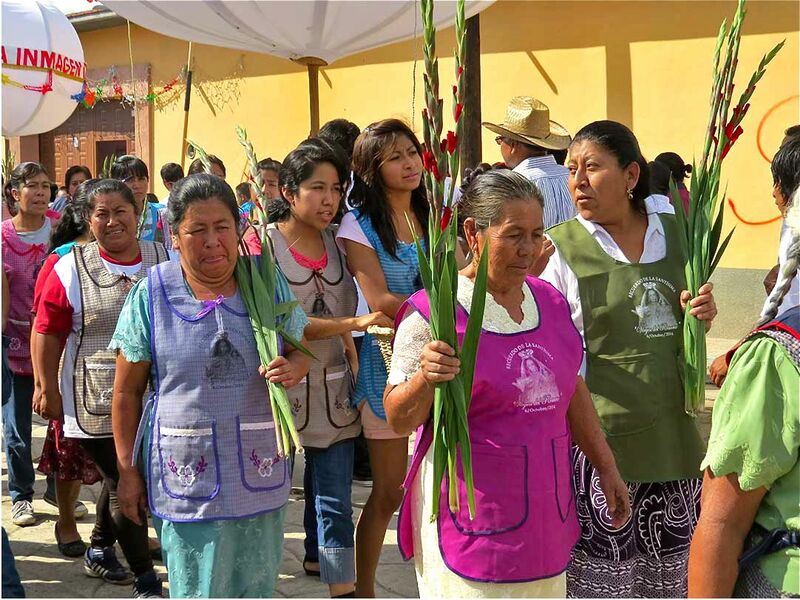 On October 8, 2014, Juquila received a papal coronation, joining her previously crowned (1909) Oaxaca sister, Nuestra Señora de la Soledad. And, as I write on the night of December 8, 2018, Soledad celebrates her hermana’s day with fireworks. 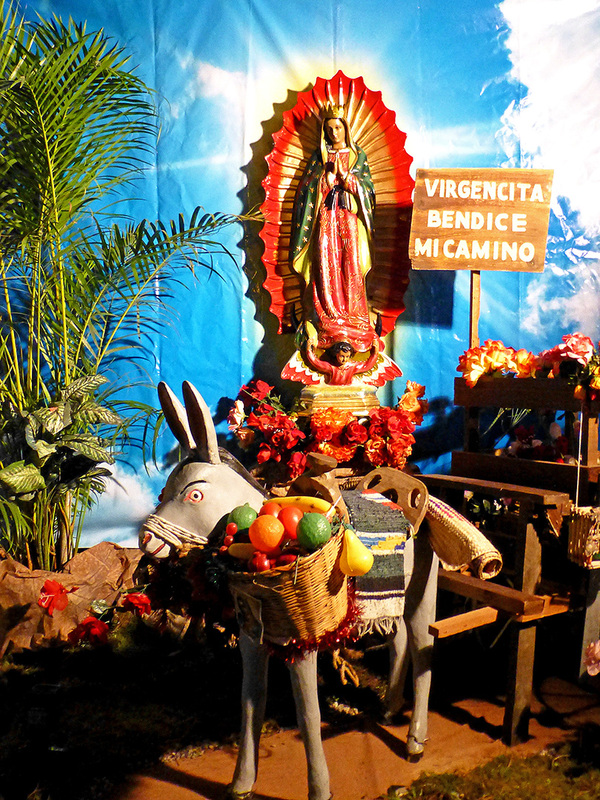 December seems to be el mes de las vírgenes (the month of the virgins) in Oaxaca. 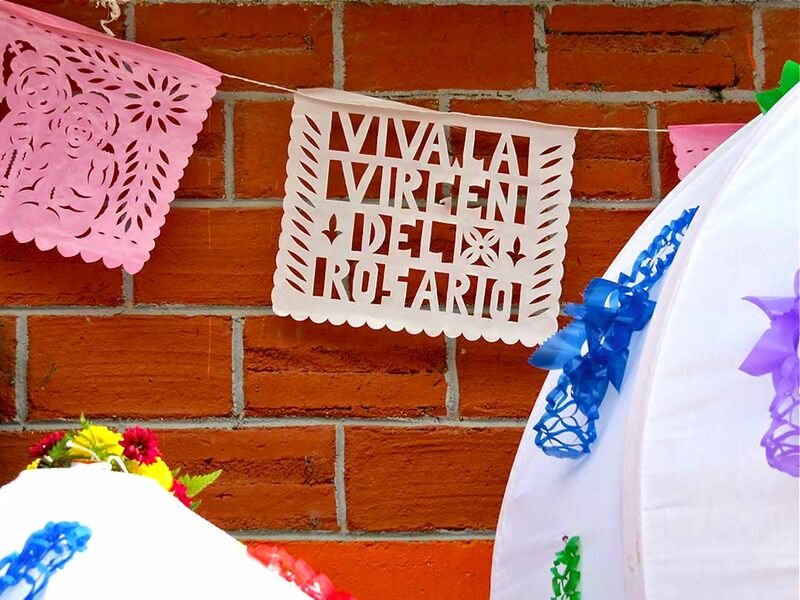 Early this morning cohetes (rockets) and church bells announced the first of the month’s three virgin days; the feast day of la Virgen de Juquila. 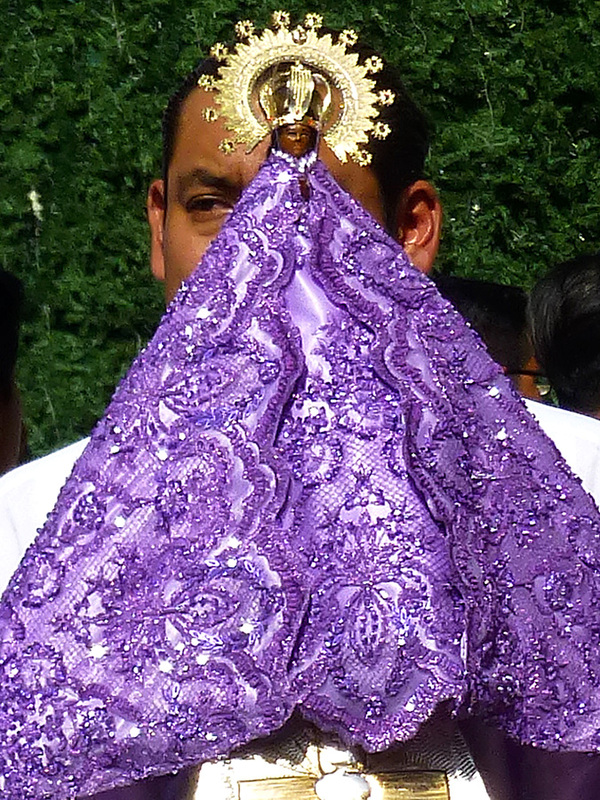 And, this afternoon, on the Alameda in front of Oaxaca’s cathedral, a small procession gathered. 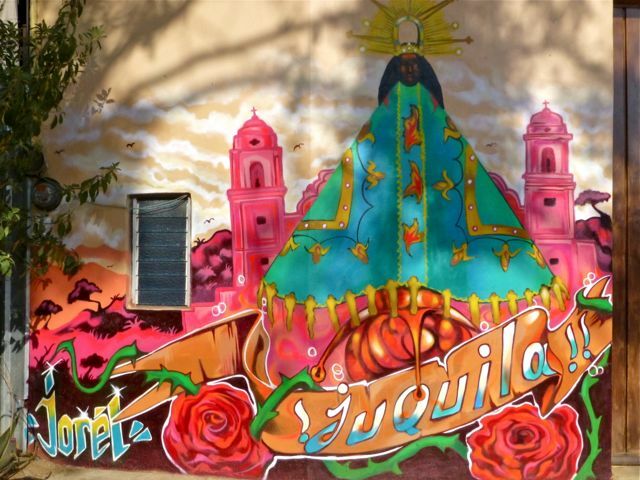 Alas, that wasn’t the end of the story; the priest in the village of Juquila convinced the “powers that be” that she should be moved to the bigger and better church in Juquila. 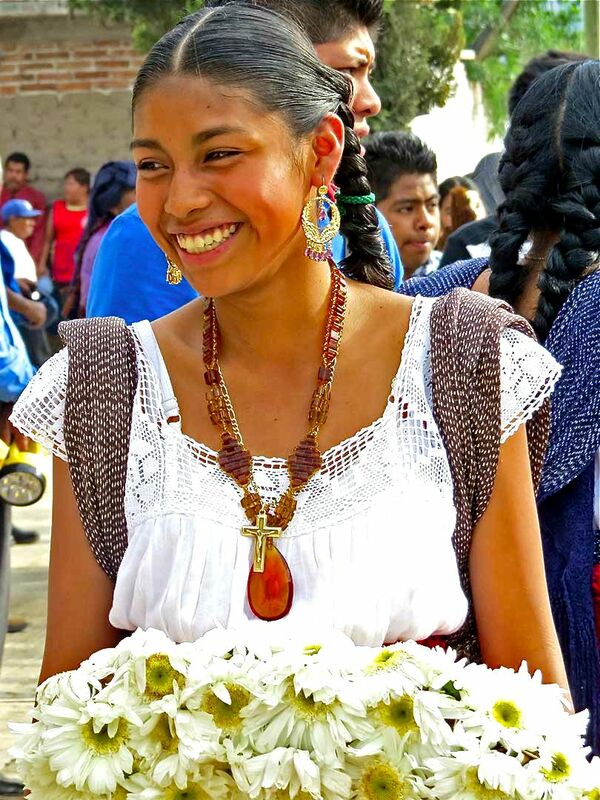 She, however, had other ideas and returned to Amialtepec. This back and forth continued another three times. Finally, in 1719, La Morenita (the dear dark one), as she had come to be known, gave up her traveling ways and agreed to call Santa Catrina Juquila her permanent home. 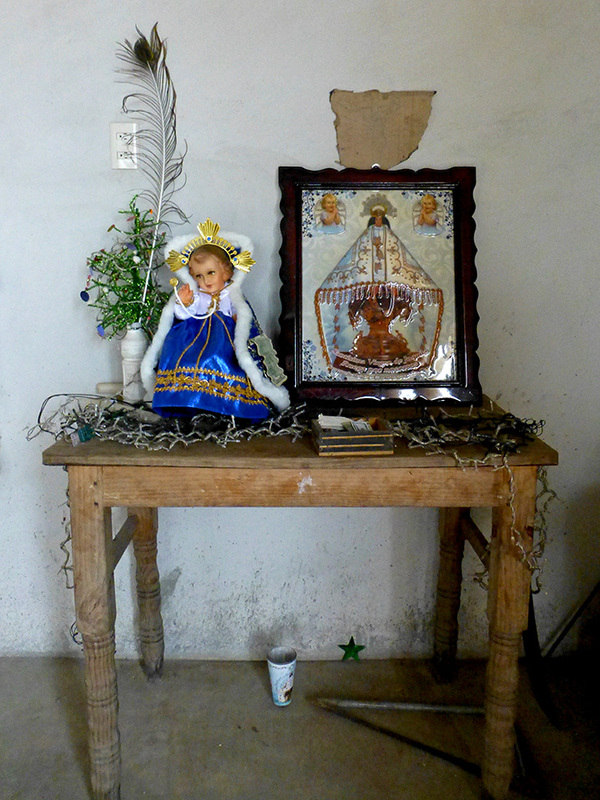 The faithful make pilgrimages to both her old and new mountain homes (about four hours southeast of Oaxaca city). They come year round on foot, on bicycle, and in all other manner of transport, to make offerings and pray for miracles, but especially during the days leading up to December 8. 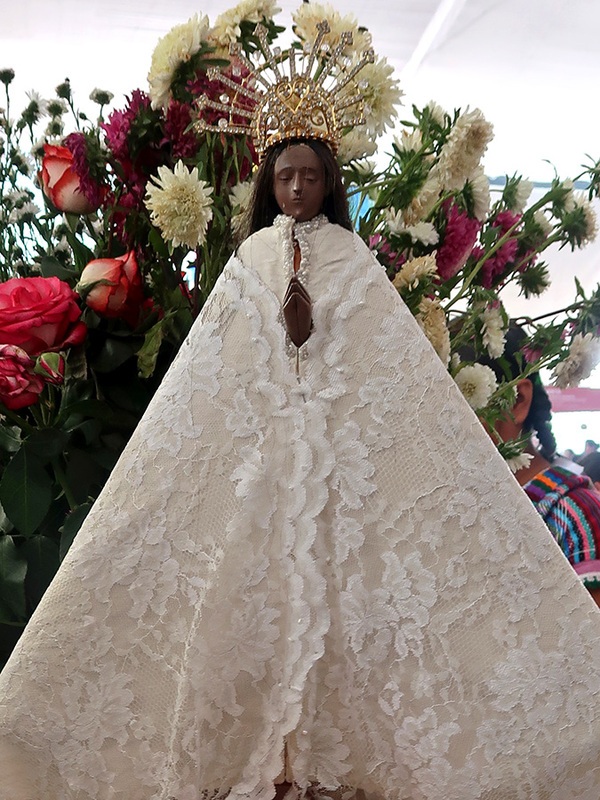 October 8, 2014 marked her crowning achievement; in a grand ceremony, she received a papal coronation, joining her previously crowned (1909) Oaxaca sister, Nuestra Señora de la Soledad. 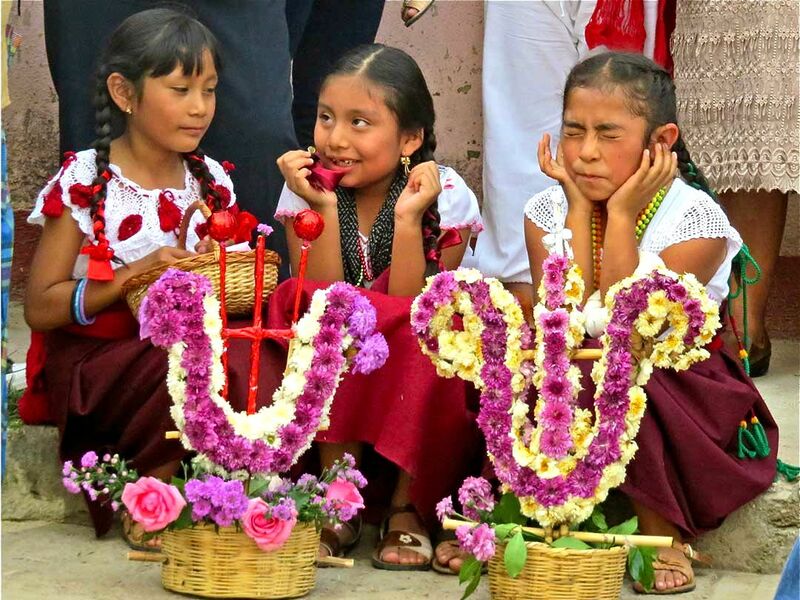 No doubt, tomorrow I will be awakened, long before the crack of dawn, by the cracks and pops of cohetes (rockets — all bang no bling) and the seemingly non-stop clangs and bongs emanating from the bell towers of the countless churches that surround me in Oaxaca city’s historic district. 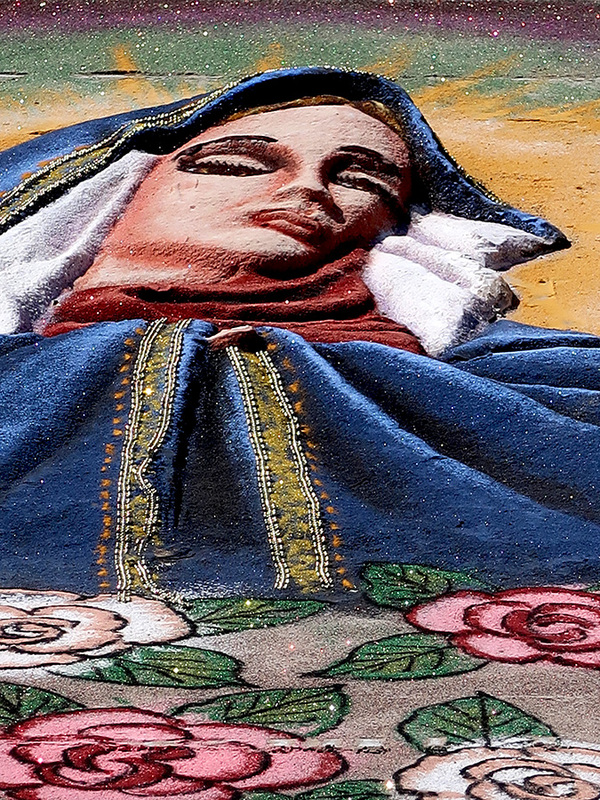 And, I’m sure, I will hear the sounds of a procession — December 8 is the feast day of the Virgin of Juquila (La Virgen de Juquila). 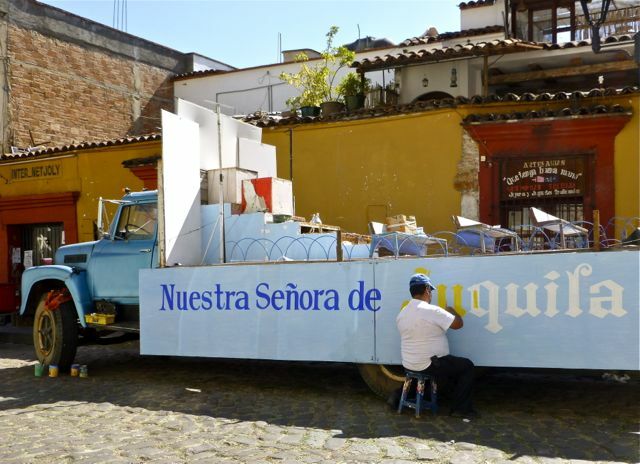 Flatbed truck on Constitución in Oaxaca city, Dec. 6, 2012. 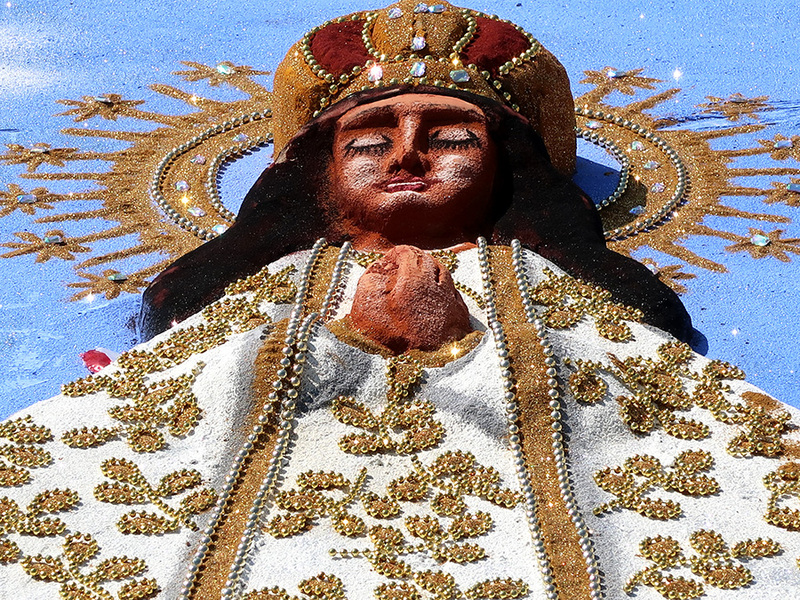 According to legend, in 1633, when a fire burned the small Chatino village of Amialtepec to the ground, a small wooden statue of the Virgin Mary was rescued amidst the ashes. She was undamaged, save for her light skin color, which was permanently darkened by the smoke, causing her to more closely resemble the Chatino people, who live in this remote mountainous region. 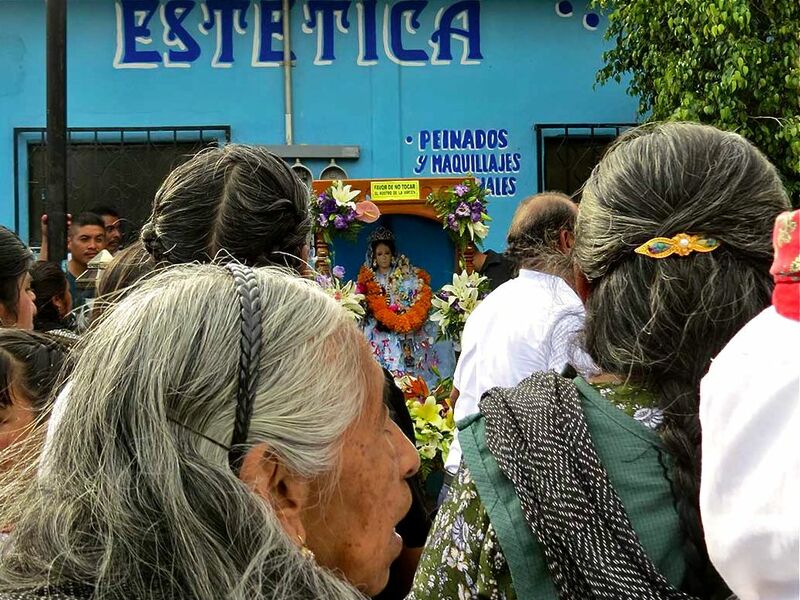 Local priests declared her survival a miracle and she has been venerated ever since and her image appears throughout Oaxaca. 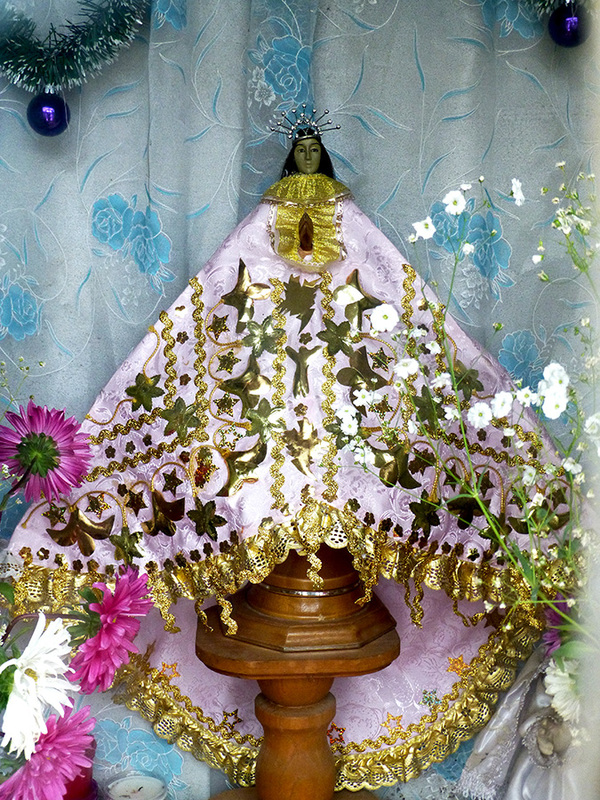 Image of La Virgen de Juquila along highway 175. 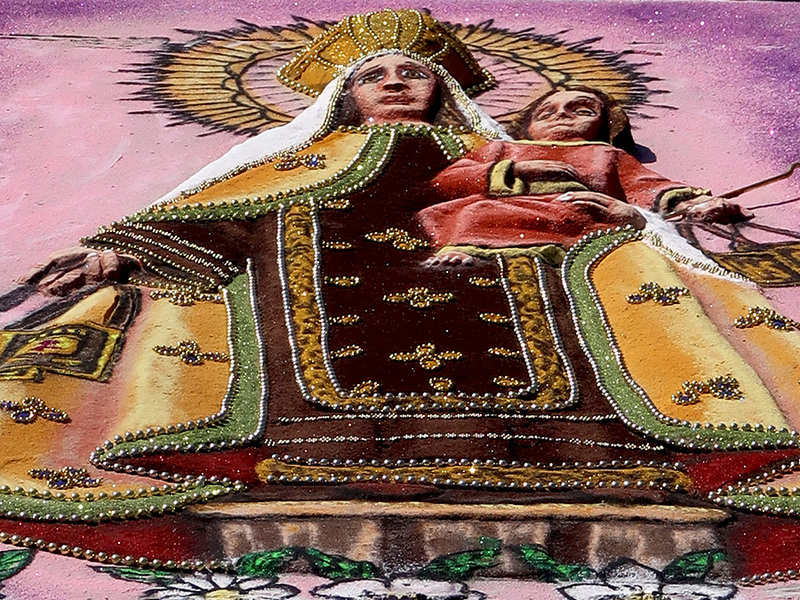 In 1776, the Bishop had a new temple built for La Virgen de Juquila in the nearby, but larger, village of Santa Catarina Juquila. 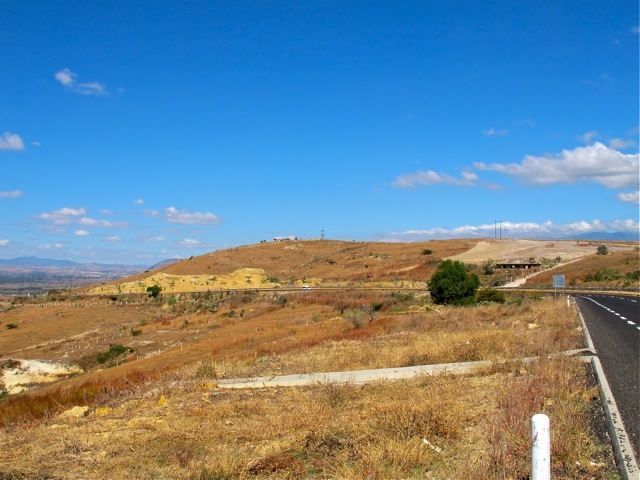 Today, pilgrims continue to come, not just on her feast day, often making the arduous journey up into the mountains by bicycle or even on foot. 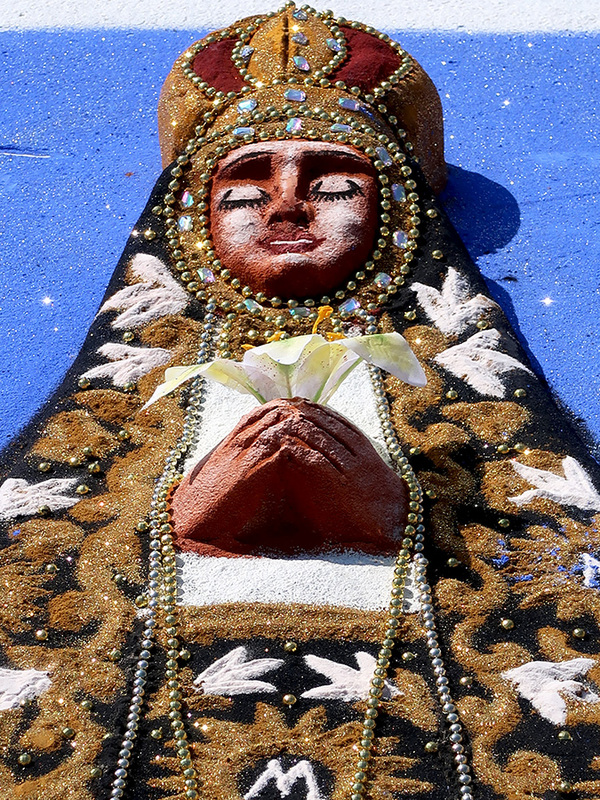 They go to La Capilla del Pedimento in Amialtepec to fashion images from its clay soil — replicas of wished for items (cars, houses, healed body parts, etc.) to lay at her feet. Riotous clanging from Soledad’s bell towers at 4:45 AM yesterday rudely interrupted a peaceful sleep. 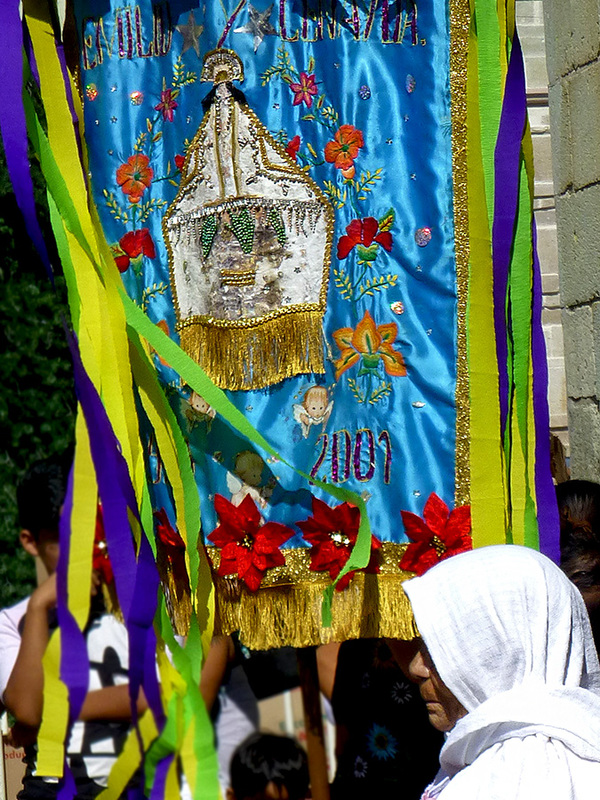 Explosions of cohetes and other church bells soon joined the morning’s 2-hour long Virgen de Juquila soundtrack. Chimes, rockets, loudspeakers announcing the presence of the water and gas vendors, fried plantain wagon steam-whistles, horns honking, bus gears grinding, and booming base emanating from open car windows; it’s all part of the cacophony one comes to know and love when living in Mexico. This definitely didn’t have anything to do with virgins! This was a music festival that almost didn’t happen. According to event promoter, Thorvalo Pazos Hoga, they were initially denied a permit, “on the grounds of religious and traditional festivals that are celebrated in the month of December in the city.” A silly argument, was his response. I arrived in the early afternoon and fanaticos (love that word for fans!) were just beginning to gather at the Plaza del Carmen Alto. 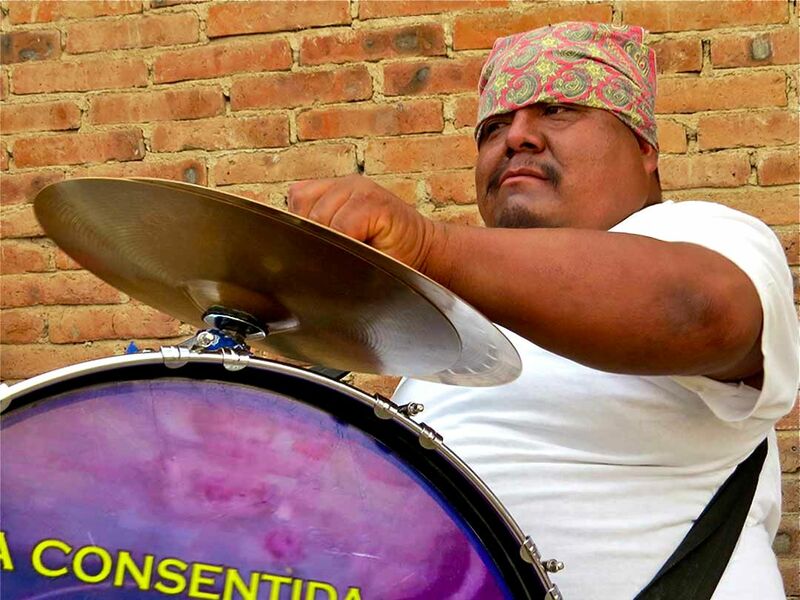 Ska, hip hop, heavy metal, rock, electronic music, and more would be adding to Oaxaca’s soundtrack until 11 PM. Yes, we have no marimbas; the music was not your grandparents’ sones and jarabes. The bands had names like: K-OS Party, Cayune, Pichancha, Rekto de Cerdo, Dr. Jekill y Mr. Hyde, Herpes, Coito Violento, Forever, and Survival. Probably not even your parents’ music! 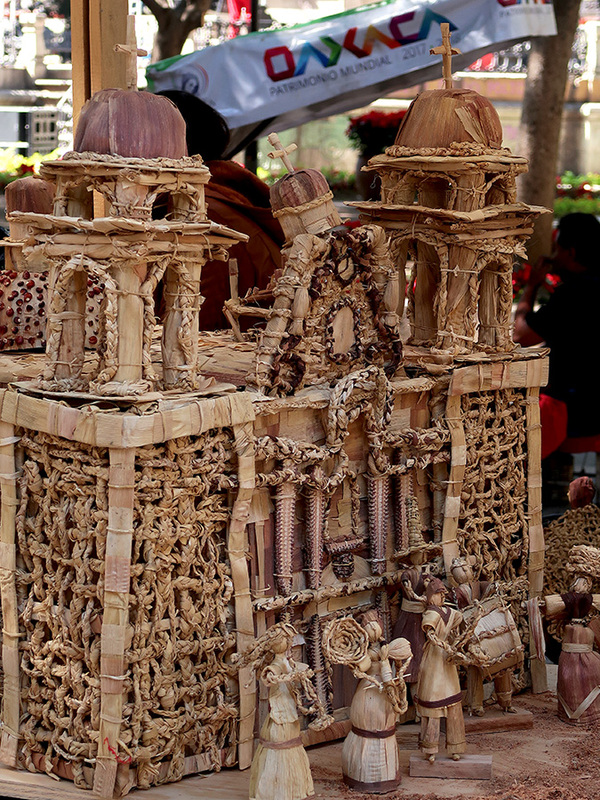 Oaxacan graphic artists designed the stage set. Love how they re-imagined the traditional Navidad piñata. 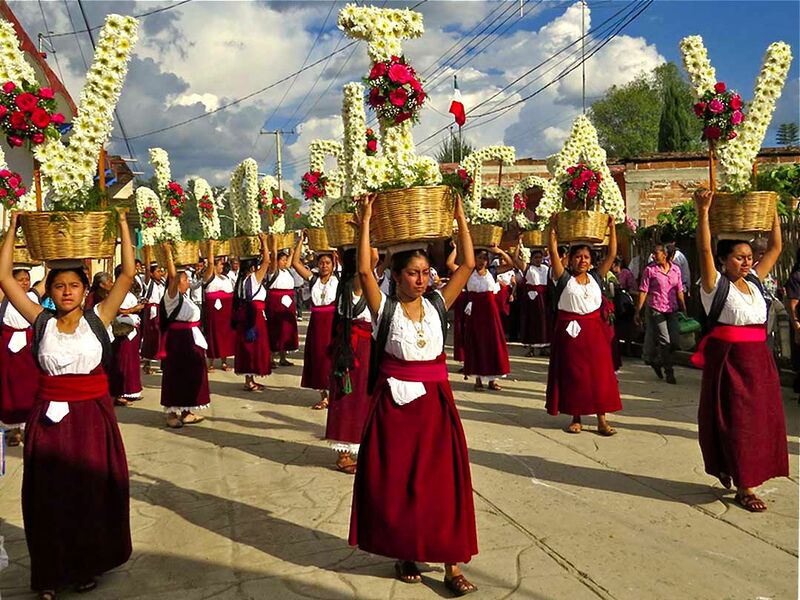 December seems to be quite a month for the Virgins of Oaxaca. December 8, I was awakened by cohetes (rockets… all bang, no bling) at 4:45 AM. 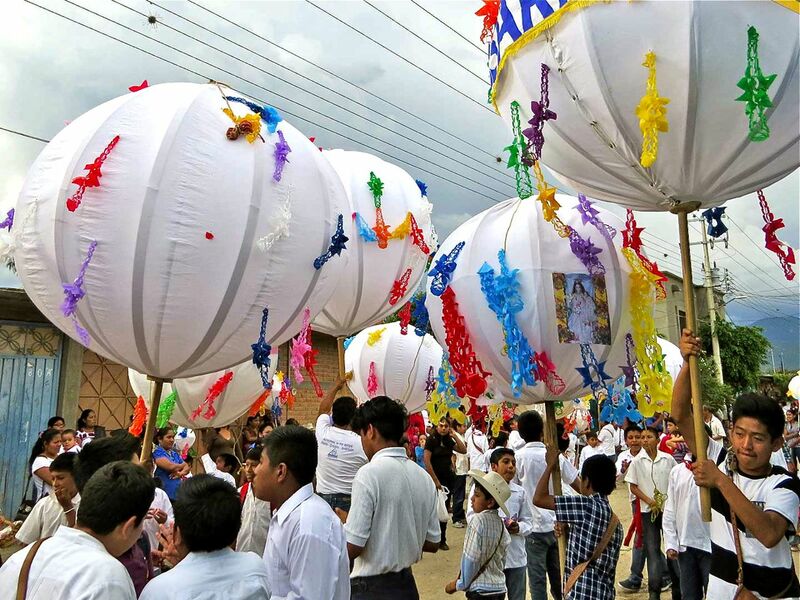 They continued sporadically until about an hour later, when wildly clanging church bells heralded a non-stop barrage of more cohetes for several minutes… they eventually faded away, but a banda was heard in the distance. 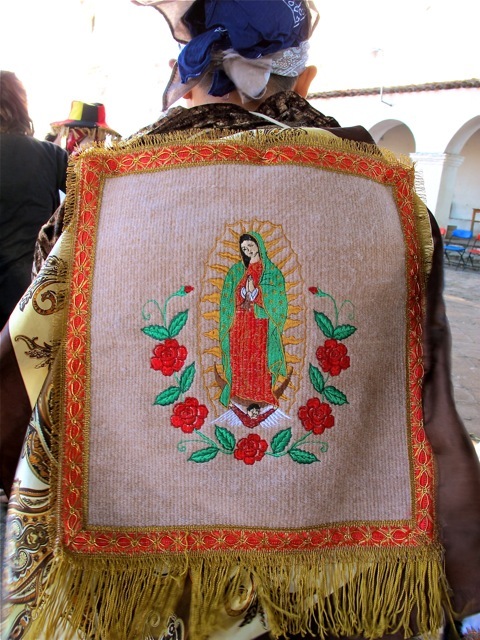 It was the feast day of the Virgin of Juquila (La Virgen de Juquila), one of Oaxaca’s own. 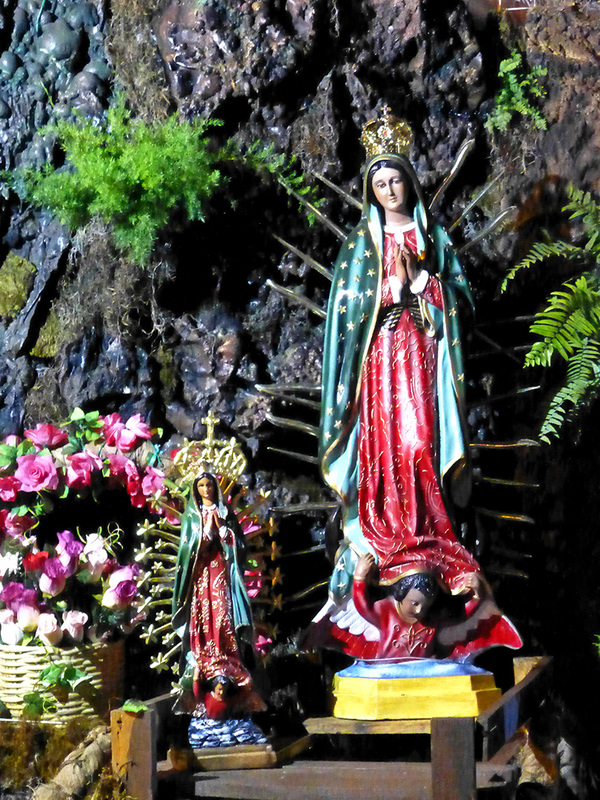 According to legend, in 1633, when a fire burned the small Chatino village of Amialtepec to the ground, a small statue of the Virgin Mary was rescued amidst the ashes. It was a miracle; she was undamaged, save for her light skin color, which was permanently darkened by the smoke… causing her to look more like the Chatino people, who revered her. 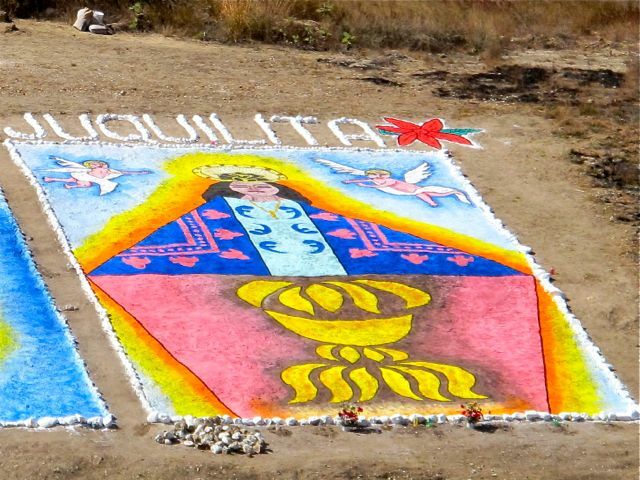 Here she is, in a field alongside La Virgen de Guadalupe, almost at the crest of the new carretera between Oaxaca and San Martín Tilcajete. 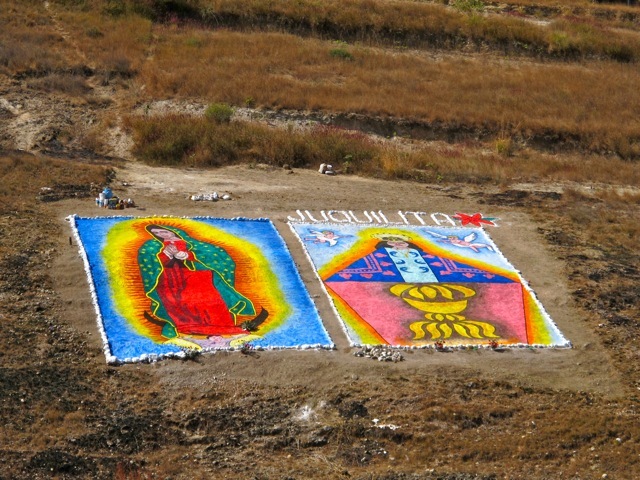 La Virgen de Guadalupe on the left and La Virgen de Juquila on the right. 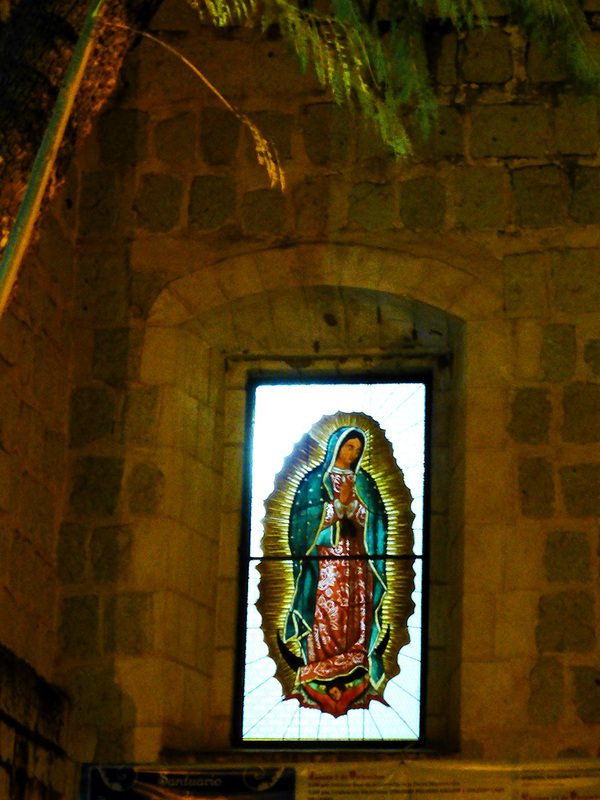 The Virgin of Guadalupe had her day only four days later, on December 12. 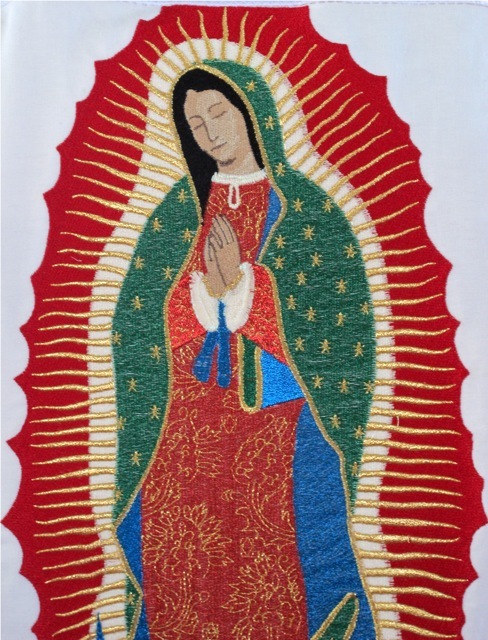 La Virgen de Guadalupe is known as the Queen of Mexico and Empress of America, and is the patron saint of México. 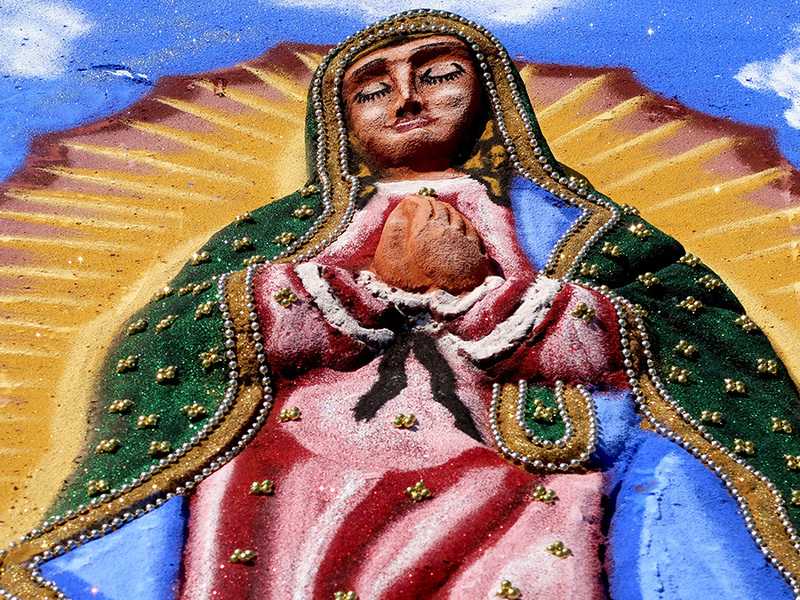 Reports estimate that 5.8 million of the faithful made the pilgrimage this year to Basilica of Our Lady of Guadalupe in Mexico City to honor the dark-skinned virgin who appeared to Indian peasant Juan Diego on Dec. 12, 1531 near what is now Mexico City. The weaving and embroidery were spectacular! 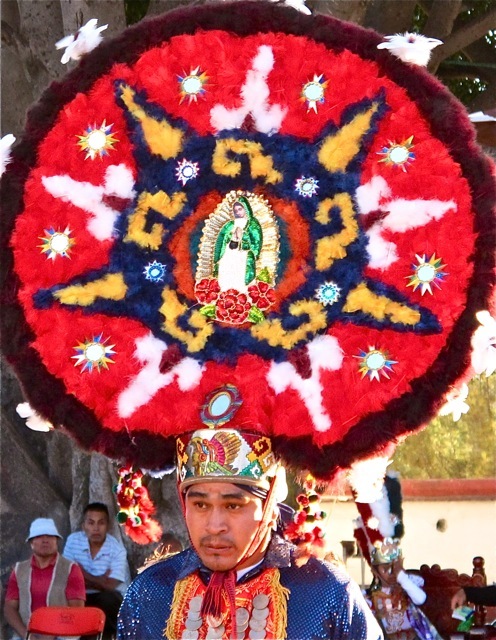 And, at least one of the Danzantes had an image of the Virgin of Guadalupe in the middle of his corona (feathered headdress). 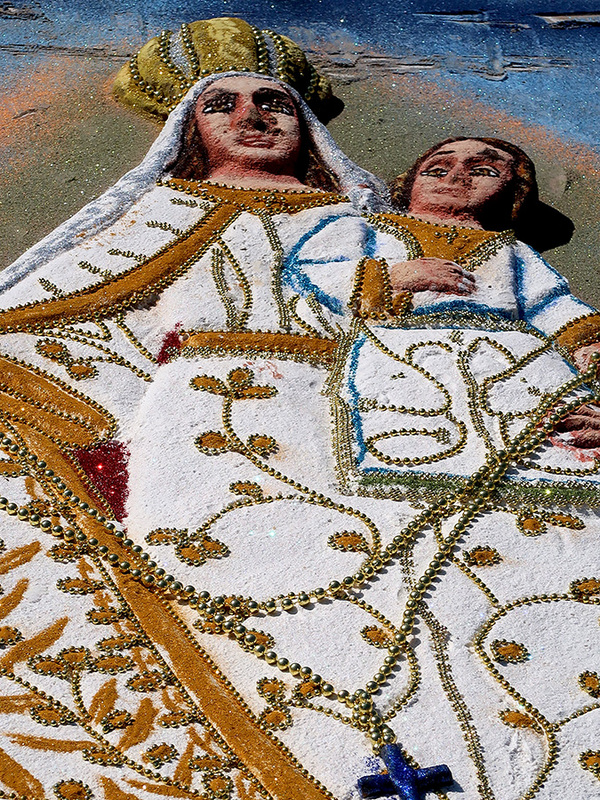 Malinche and Doña Marina also had similar images on the skirts of their dresses. 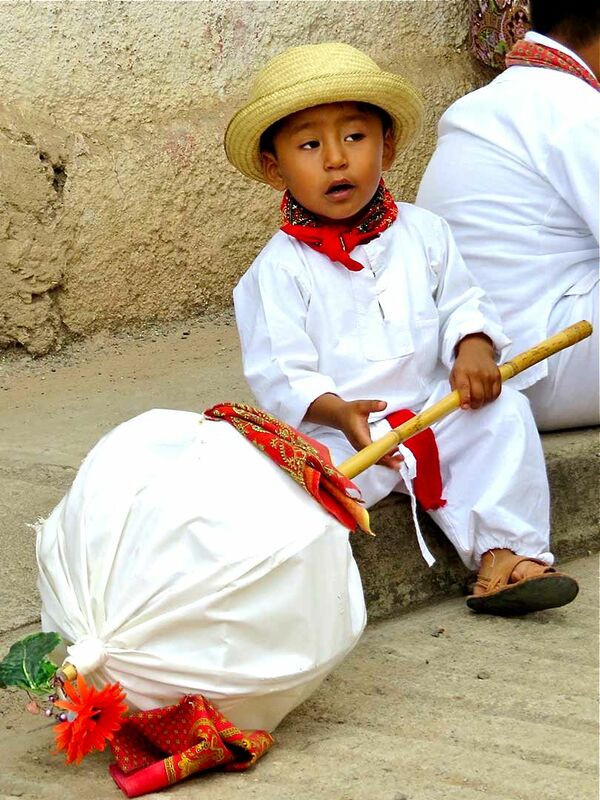 To see those and several other photos of the dancers, you should take a look at what Chris has posted at, Oaxaca-The Year After.